There are four interviews for you in this packed show – ranging from the most terrible climate news to the most hopeful. I don’t know how to convey the power of this interview. It’s one of the most touching I’ve ever done. Here is Charlie (nicknamed after Charles Darwin) who began diving at a young age, and has now logged over 6,000 hours under water. His passion is coral. He literally “wrote the book about it”. Veron loves the whole coral society, not just the little creatures who build brightly colored homes that become reefs of geologic proportions. Not just their variation over hundreds of millions of years. But the swirl of living things that depend on the reefs. He tells us one third of all sea life spends at least part of their life cycle in coral reefs. Now something he never imagined possible: the coral is dying. It’s bleaching and dying in Australia, in the Indian Ocean, off Hawaii, all over. Apparently the coral animals co-evolved to use a type of algae to create their food. The algae was selected because it produces the most at higher temperature ranges. As the ocean warms, this strategy backfires. The algae produce too much oxygen, which is toxic to most living things in high amounts. To survive, the coral polyps eject the algae, but that dooms them to starving to death. Charlie says most coral will not survive to rebuild. Perhaps other coral animals will come to the reef, but meantime the characteristic dead white color changes to other colors, as slime takes over. So within a few weeks, it’s less apparent the reef has died. But it’s dead. Storms will batter it. Sea life leaves or dies. It’s a catastrophe for nature. And bad news for over 70,000 people in Australia alone who depend on tourism or other aspects of the Great Barrier Reef. The economic cost to Australia could go over 7 billion dollars. In other parts of the world, fisher people and their customers will go hungry without the living coral reefs. There are many, many cascading impacts. Meanwhile, the current Australian government, really both parties, support expanding coal mines and coal ports, even right in the reef zone. That carbon makes sure the World Heritage Site, the Great Barrier Reef, will be inherited by no one. It’s raw insanity. No one knows how much ocean life we are already losing. Top scientists warn humans must start removing carbon dioxide from the atmosphere, or encounter a climate catastrophe. The Intergovernmental Panel on Climate Change assumes we will use so-called carbon capture and storage. But where is the technology to do it? Nothing reliable has appeared, until now. A project in Iceland has discovered a way to convert carbon dioxide into stone, in less than two years. That is a game-changer, but it has limitations. Let’s discover what this new tech, called CarbFix, is all about. Our guest is a co-author of a new paper published in the journal Science on June 10th, 2016. The title is “Rapid carbon mineralization for permanent disposal of anthropogenic carbon dioxide emissions”. Dr. Martin Stute was educated at Heidelberg University. He is now Professor of Environmental Science at Barnard College, Columbia University in New York, and a hydrologist at Columbia University’s Lamont-Doherty Earth Observatory. It’s exciting news. We are not talking about a theory or a model, but a carbon storage process that’s already worked. You could hold a piece of this new carbon stone in your hand. The experiment is now called CarbFix. It’s run at a thermal generating plant not far from Reykjavik, the capital of Iceland. There heat from volcanic steam down below is brought up to the surface to power electric generators. It’s “green” energy, because they don’t burn fossil fuels. There is one weird thing about Reykjavik Energy. Even though fossil fuels are not involved, the volcanic gases contain some carbon dioxide (about 5% of what a fossil fuel plant would produce, but still an important amount.) The Icelanders wanted to capture that carbon, as well as dispose of the rotten-egg smelling sulfur dioxide that also came out. In conjunction with Columbia University and other institutions, they lightly processed this gas (to remove hydrogen, I believe) and then pumped it back down into the ground deep below. 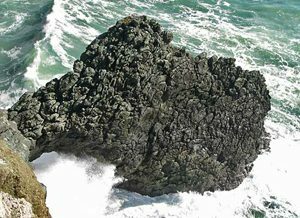 That rock is the kind called “basalt” – which is essentially made from cooled lava. There are chemicals in basalt which can mix with carbon dioxide to form a stone. The process also needs lots of water. For a while, most of established science thought this process to make new carbon-loaded stone would take a long time, perhaps a century of two. Then a few models suggested it could happen in a decade or two, but that was doubted by most scientists. So the whole team got a shock when just under two years into the project, their pumps clogged up and stopped. Hauling them out, they were filled with a whitish rocky mass, which was the carbonized stone, formed much faster than anyone expected. This means that wherever there is basalt rock, and enough water, carbon dioxide really could be safely stored back underground. Unlike previous carbon storage schemes, this does not leave the carbon as a gas which might leak out of cracks, or be released by earthquakes. It should stay stable, under the earth, for centuries, maybe forever. It’s huge news for the carbon capture and storage idea, which by the way, all the Intergovernmental Panel on Climate Change pathway projections assume will happen. There are limitations. Enough water must be present. Scientists do not yet know whether or how well this process will work using sea water. That matters especially because (a) a majority of the world’s fossil-powered generating stations are with the population, within 50 miles of the sea coast and (b) most of the sea floor around the world is basalt. About 10% of land away from the sea is also basalt, including major deposits in Washington State (the Columbia River Basin); in Russian Siberia, and Basalt other places, including significantly India. All those places, plus the seaboard locations, may be able to use this CarbFix technology to store carbon. This still leaves the “capture” process a bit undeveloped. My impression is that more research is needed to bring technologies for capturing carbon without generating still more greenhouse gases. Still, it’s all good news from Iceland, as a way to store carbon dioxide in the right circumstances. We need to capture and store a lot, to bring CO2 levels down below 350 parts per million. Just this past week, it’s been announced that CO2 levels are now above 400 ppm permanently, a very dangerous level. The science behind this is: “Rapid carbon mineralization for permanent disposal of anthropogenic carbon dioxide emissions“, co-authored by our guest Martin Stute, and published in the AAAS journal Science on June 10, 2016. Here is CarbFix another good article about the CarbFix discovery. At the 2015 world leaders’ summit in Paris, there was a lot of talk about saving the climate But fossil fuel burning is only increasing. What if we do it. What if we burn the currently known reserves of reasonably accessible coal, oil, and gas? What happens to the world climate, and could humans survive there? We know a bit more about that, thanks to a scientific letter published May 23rd, 2016 in the journal Nature Climate Change. The title is “The climate response to five trillion tonnes of carbon”. We’ve reached the lead author, Kasia Tokarska. She’s from the School of Earth and Ocean Sciences, at the University of Victoria in Canada. There is a surprise in this new paper. some previous science suggested that as we overload the atmosphere with carbon dioxide, the impact of even more, say another trillion tons, becomes less than the earlier pollution. Unfortunately, this new study says that is incorrect. Climate disruption will continue to escalate at a furious pace, even at the later stages of burning fossil fuels. This letter in Nature Climate Change also talks about important changes to precipitation, if we burn all the fossil fuels. Some places will get QUADRUPLE their present rain, while others will dry out to deserts. The paper title is: “The climate response to five trillion tonnes of carbon” as published May 23, 2016. Or read this article in the Guardian newspaper, which explains why parts of the Middle East (the source of so much oil and gas) will become uninhabitable. I interviewed Australian scientist Steve Sherwood in 2014 about underestimating the role of clouds in global heating. In a paper on the uncertainties of using CMIP5 climate models, Friedlingstein et al. discuss CO2 levels this century between 795 and 1145 parts per million. That’s double to triple what we have today. Kasia tells us their models showed CO2 levels rising to 1200 parts per million as we burn the fossil fuels. The paper led by Friedlingstein talks about difficulties predicting the carbon cycle feedbacks on land. One of those is the release of CO2 and methane from thawing permafrost in Canada, Alaska, and Siberia. In 2012, your co-author Andrew Weaver also co-wrote a paper on the permafrost threat. This new work does not yet account for feedbacks from a rapidly changing Arctic. Add that on. The Weaver paper is: MacDougall, A. H., Avis, C. A. & Weaver, A. J. Significant contribution to climate warming from the permafrost carbon feedback. Nature Geosci. 5, 719–721 (2012). For those who don’t know, a co-author of this paper is Dr. Andrew Weaver. He is arguably one of Canada’s best known climate scientists. In our last Radio Ecoshock interview, in September 2015, Andrew Weaver questioned the need for more climate science. He suggested more science wasn’t as important as urgent action. So he ran for the Green Party. Weaver was elected as the only Green in the Provincial Government of British Columbia, Canada. Yet here he is, still co-authoring, and I suspect mentoring, important climate science. You can hear my interview with Andrew Weaver on our prospects, and why he ran for the Green Party. Radio Ecoshock 150923 in CD Quality (56 MB) or Lo-Fi (14 MB). Show blog Andrew Weaver on Radio Ecoshock. That 29 minute interview with Dr. Weaver is available in fast-downloading Andrew Weaver interview Lo-Fi here. I think our guest Kasia Tokarska represents two growing trends I’ve seen developing over the past half dozen years in climate science. First, more important work is coming from undergrads, like Kasia. Previously in publications, the most senior author was always listed as lead author, even if the undergrad inspired and did most of the work. I think this change reflects the urgency of the climate situation. Second, more important science is coming from women. This promises us a new generation of women climate scientists. Am I wrong to think women have generally been known to think more about future generations? We finish this program with a short interview from the Australian radio-maker Phil Stubbs, as he talks with visiting scholar Stefan Rahmstorf of the Potsdam Institute. Thank you Phil for sharing your work with Radio Ecoshock listeners. We are out of time for this show. It’s a ton of work getting four guests into one program! But there’s so much important climate research going on, and so much extreme weather already. we’ve all got to keep learning, talking – and acting to do whatever we can. If you feel inspired to help me keep going, please make a donation, or sign up to be a monthly subscribing supporter Donate here. Thank you for caring about your world, and please tune in to Radio Ecoshock again next week. Regarding Carbfix, The average greenhouse-gas pollution is about 5.5 tons CO2e per year per person. The process requires 25 tons of water per ton of co2. This corresponds to 137000 liters per person per year or about 370 liters per day per person. According to the UN a person requires 110 liters of water per day for basic needs. So the process requires roughly 3.5 times the average person water need. And then there is the energy required to run the process. Alex, I appreciate all your diligent efforts to bring all this information forward for the public. Thank you for doing it. However, I think you’re a special type, the climate journalist who can’t see the forest for the trees perhaps? The evidence is so strong, how can you not see what will happen to most vertebrates in the next 50-100 years at the most? Just wondering where you imagine your grandchildren’s children will be living, or indeed your grandchildren, by 2100.